Over the last half century, exceptional changes in the natural environment attributed to human activities have placed renewed importance on the study of society-nature interactions. Contemporary problems such as climate change, loss of biodiversity and valuable ecosystems, and resource depletion have been greatly exacerbated by the unsustainable ways in which humans interact with their environment. Indeed, the magnitude of the problems we now face is an outcome of a much longer process, accelerated by industrialisation since the nineteenth century. 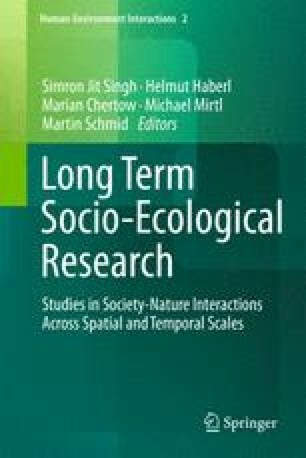 There is evidence that ecosystems are increasingly challenged by coping with human demands (Millennium Ecosystem Assessment 2005) and that costs and benefits of the use of nature’s bounty are unequally distributed socially and geographically, inducing great potential for social conflict (Hornborg et al. 2007; Martinez-Alier et al. 2010). In this sense, the present problems are not only “ecological” but also “socio-ecological” since the effect of how societies interact with their environment has a bearing not only on ecosystems but also upon social systems and human wellbeing. LTER Europe. (2011a). EU-US-LTER conference in Motz/France. http://www.lter-europe.net/events/european-american-workshop-ltser. Accessed 19 Dec 2011. LTER Europe. (2011b). Long term socio-ecological research: What do we know from science and practice? http://www.lter-europe.net/events/lter-events-links/long-term-socio-ecological-research-what-do-we-know-from-science-and-practice. Accessed 19 Dec 2011. LTER Europe. (2011c). Middle East LTER startup meeting in Aqaba/Jordan. http://www.lter-europe.net/events/middle-east-lter-start-up. Accessed 19 Dec 2011. Mirtl, M., Boamrane, M., Braat, L., Furman, E., Krauze, K., Frenzel, M., Gaube, V., Groner, E., Hester, A., Klotz, S., Los, W., Mautz, I., Peterseil, J., Richter, A., Schenz, H., Schleidt, K., Schmid, M., Sier, A. R. J., Stadler, J., Uhel, R., Wildenberg, M., & Zacharias, S. (2009).LTER-Europe design and implementation report – Enabling “Next generation ecological ­science”: Report on the design and implementation phase of LTER-Europe under ALTER-Net & Management Plan 2009/2010.Vienna: Umweltbundesamt (Environment Agency Austria). http://www.lter-europe.net. Accessed June 2011. NSF. (2011a). Dynamics of coupled natural and human systems (CNH). National Science Foundation (NSF). http://www.nsf.gov/funding/pgm_summ.jsp?pims_id=13681. Accessed 25 Nov 2011. NSF. (2011b). The US long term ecological research network. National Science Foundation (NSF). http://www.lternet.edu/overview/. Accessed 25 Nov 2011.